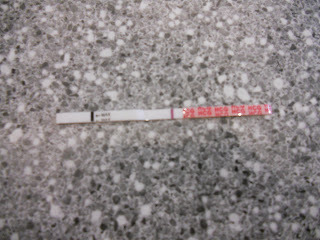 My real negative pregnancy test from this morning. 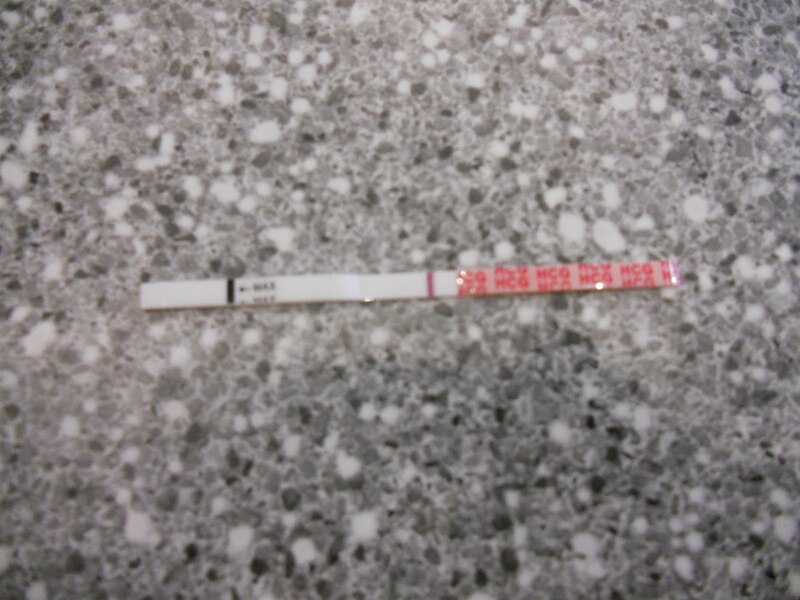 It's only 10 DPO, but since most women who are pregnant get a +HPT by now and considering the unexplainable hives that continue to cover my body, I thought I'd take an HPT this morning...negative...again. It never gets any easier seeing that blank whiteness next to the control line. I knew there was no reason to get my hopes up. Call me Debbie Downer, but I felt exactly the same as my last 26 cycles...so, I really should have known better. I guess deep-down I did. Last night I ran into an acquaintance/friend. You know, the type of person you enjoy being around; but circumstantially only see every so often at parties or through other mutual friends, etc.? Well, I like this girl, I really do. I saw her coming around the bend at T*rget...mom and I were in the baby department getting stuff for an upcoming baby shower we're planning (yeah, fun times) and I guess I didn't put two and two together, because she already has two kids. I yelled out her name and said, "Hey, do you have the munchkins with you?!" To which she replied, "Yep, those two and of course the one on the way!" She smiled and patted her small baby bump. I don't know how many times I can hear, "Woops, we're preggo again." before I'm going to lose it. Sometimes it seems like a terrible joke. And, of course, I have to deal with the ever-present, "When are you going to have kids? Don't you like kids? Don't you want kids?" questioning. How ignorant and hurtful can people be? Seriously, don't they ever think of anyone else's feelings and circumstances before they speak? I know this is an angry-sounding post, but I suppose it's only because this is it. This was our last cycle. There won't be enough time to try again before the home study, and after that we cannot get pregnant or our adoption will be terminated. So, this.is.it. The topics on this blog are about to change drastically. I'm sure I'll still write about PCOS and IF in general, but for my own sanity I need to start shifting my focus to adoption. If you've been following along, thank you. Your support and kind words have meant so much more than you'll ever know - really and truly, I am so grateful. I know that God sent some of you to write things at just the perfect time to cheer me up and keep me motivated. So, again, THANK YOU. I am looking toward the future with a bit of trepidation, I have to admit. I feel as though Mr. C and I have been through so much emotionally and beyond, I cannot imagine what the adoption realm is going to be like this time around. I know how heart-breaking it was the first time, and we were only about 4 months into it then. I am just praying for protection and wisdom and guidance every day for this adoption. I do not want to be hurt again. Mr. C and I have actually been toying with the idea of a domestic adoption - something we said we'd never do. We found a lawyer in Arkansas who works on nothing but adoption cases; so, we feel like we would have someone on our side who really understands the entire process and can help protect us from potential harm. We have some time to work things out, we have much to do before we can really start things up anyway. So, who knows? It's my dad's birthday today........I had this idea that I would be pregnant, and I was going to get him a "happy birthday grandpa" card. Your post brought tears to my eyes. Maybe it sounds strange, but I've become very emotionally invested in your journey and I've been hoping and praying that you could have the best of both worlds - pregnancy AND adoption. I'm so sorry that this latest test didn't bring good news. I hope this new agency is the one that will bring you your much longed for child. Oh M, thank you so much! I was hoping for that same thing, but I guess it wasn't meant to be. I hope you are doing well...I know you've got a lot coming up this cycle, and I wish you the very best! I'm so sorry - your post made me cry. Praying that you will find peace and have an easy time with your adoption. Just wanted to say that as a new reader of your blog I am grateful for your posts. My story is long and complicated but both IVF and adoption are very real possibilities for my future. I look forward to following your journey.. wherever it may take you. Thanks again for your kind words and support! Much good luck and big (((HUGS))) to each of you!